The robust Zeiss Victory Z-point red dot reflex sight offers waterproof aluminum housing, battery or integrated solar cell power, automatic intensity regulation, ultra-rapid target acquisition, and an automatic digital control system for the illuminated dot. 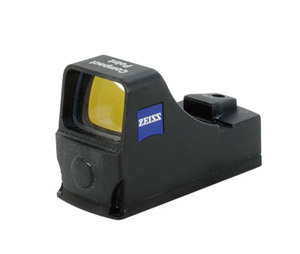 Lightning quick, the Zeiss Victory Compact Point reflex sight is ideal for moving game with a small field of view. Keep both eyes open using the finely controlled illuminated dot and fire a second shot straight away. The Compact Point features rapid target acquisition, LotuTec water repellent coating, one-touch button to turn the illuminated dot on and off, three mounting options, and is powered by just two CR 1632 batteries.